This frosted rock crystal pendant is embellished by the beauty of a stamped filigree flowing design and a pierced diamond center. Delicate leaves and flowers decorate the face of this rectangular shaped pendant. Softened corners add a special elegant touch. A pierced diamond adorns the center of this pendant. Balance is brought to this pendant when the etched star burst design appears through this transparent crystal. 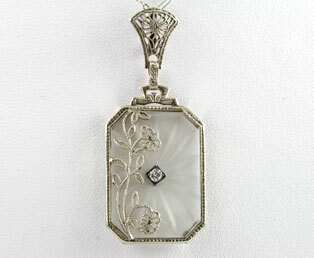 This estate pendant is suspended from a stamped trefoil bail and original white gold fetter. A 16.5" trace link chain with a spring ring clasp completes this necklace. This pendant is finely crafted in 14kt white gold. Lalique's crystal pendant designs inspired many craftsmen during this period.